While Victoria MacPhail was home for the holidays, she found this newspaper clipping in her grandfather Eric MacPhail’s scrapbook from 1979 which offers us a fascinating glimpse into the West River ferry service. It makes a couple of references to Eric’s grandfather Robert MacPhail, better known as R.A. MacPhail. 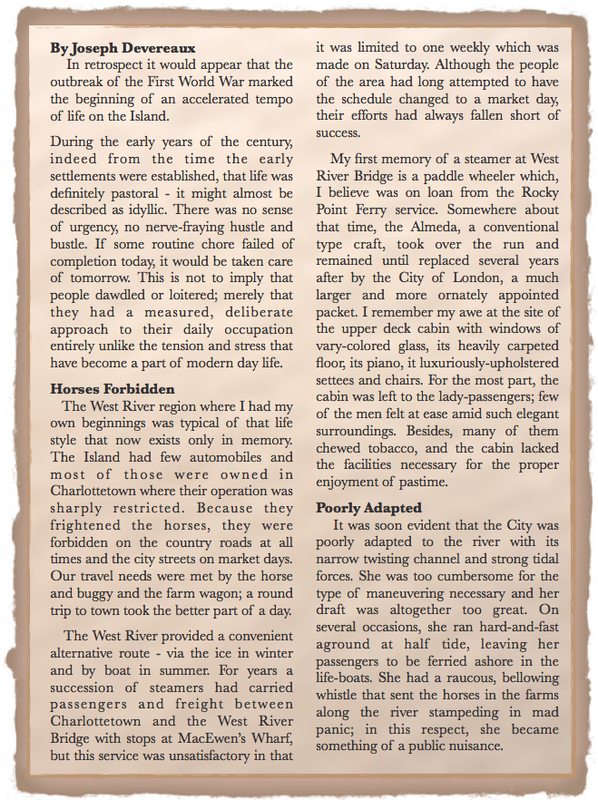 She also found a couple of links that offer more information on the ferries, City of London and S.S. Harland. This feature will take you on a journey back in time. There’s nothing like a trip down a river to bring out our sense of adventure. Enjoy and thank you, Victoria, for finding this treasure. Notes: Victoria found links offering more details on City of London and S.S. Harland at http://www.sailstrait.wordpress.com – click here for the first article. A second article specifically highlights the City of London, click here. The City of London was in service from 1903 to 1908 and was then sold to interests in Quebec. 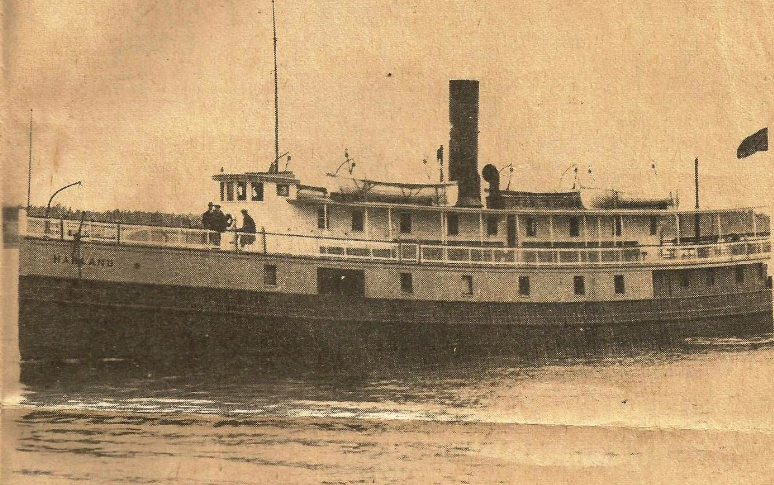 This boat could accommodate 500 passengers and the fare was 20 cents. The research makes reference to the City of London’s size, which caused difficulty during half tides. The Island Tugboat Company had the S.S. Harland built in Nova Scotia, which was named after Managing Director F.W. Hyndman’s first cousin’s late husband, Sr. Edward James Harland who was a partner in Harland and Wolff, a company that later launched the S.S. Titanic. The S.S. Harland ended its service sometime around 1936 and went to Cape Breton. 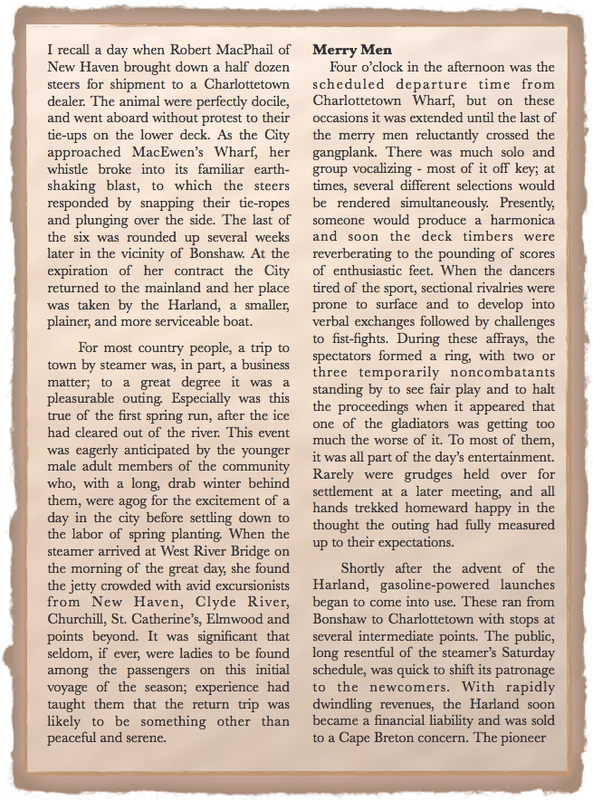 About the author of the newspaper clipping, Joseph Devereaux: Doreen Pound tells me that the Devereaux family lived in New Haven in the house across from the Legion building. There was later an antique shop on the property. On Island Register, it shows what I believe might be the family tree, click here. There is mention of a Joseph Devereaux who was born in Kelly’s Cross in 1910 (his grandfather living in New Haven), graduated at Dalhousie University in 1936 as a medical doctor and practised medicine at City Hospital in Sydney, Nova Scotia. It is nice to have some personal stories about these boats. That was a delightful read. I am interested in steamboat travel. Of course the various Fathers of Confederation arrived in Charlottetown by steamship in 1864.